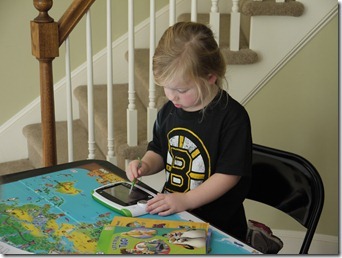 Most of us with young kids are familiar with LeapFrog’s handheld educational gaming units. Maybe it’s a LeapPad, maybe a Leapster Explorer. 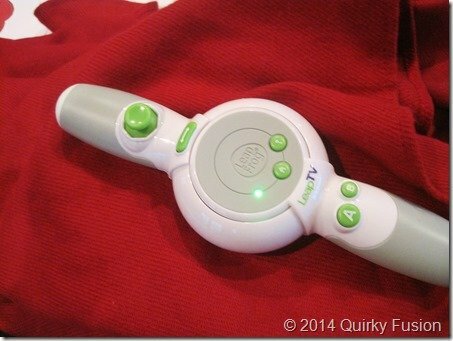 Either way, the LeapFrog LeapTV console system was a bit of a surprise. In face, when they asked if I wanted to review out LeapTV, I don’t know what I expected. I did not bargain for a full-scale console system with sophisticated controllers and a camera that could detect input both with a controller and without. Wow! LeapTV comes with the gaming system, a base for it to sit on, AC adapter, HDMI cable, a camera, a controller with wrist strap, and an option flat-screen TV mount for the camera. We received a second controller (which you can purchase separately) so we could try out some multi-player gaming. Much like other LeapFrog devices, you can purchase games either in cartridge format or (coming soon!) via digital download. Set up is easy enough. Simply plug everything together and turn it on. You can connect it to your home network for downloading more content or connecting to the LeapFrog learning path to track your kids’ learning progress. You’ll also want to set up (or attach) a profile for each of your kids (and maybe the adults, too) to help ensure that the educational content offered is appropriate for their grade level. The controller/camera experience is most like the PlayStation Move experience. Some games are played via a familiar traditional, albeit chunky, controller (see above). It also converts quickly and easily to a wand (see below) with an LED color tip that helps the camera recognize where you are pointing, similar to the PlayStation Move controllers. 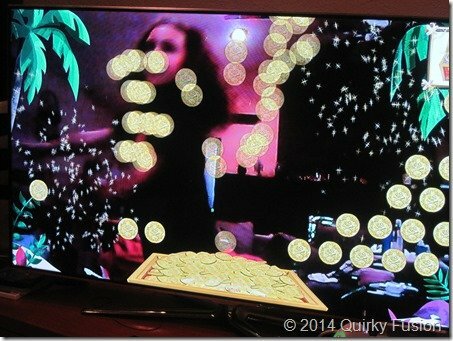 Some games use only the camera as an input device, which is more familiar to Kinect users. As such, plan on having some elbow room in whatever space the LeapTV is stationed in. The LeapTV games will be familiar to LeapFrog fans. Below you can see my daughter playing with Jake and The Never Land Pirates , but you’ll also see games with LeapFrog characters like Leap, Lily, Tad, and Mr. Pencil. The LeapTV Kart Racing: Supercharged! game is similar to one found on the LeapPad Ultra. They each include a strong (and obvious) educational component as well as fun games and activities. I was surprised at how beautiful the graphics looked on our large screen TV. AT 720p, it’s not the best resolution out there, but it’s far more than I would expect for a console geared at kids ages 3-8. The camera resolution (and light sensitivity) isn’t quite as good, but the kids enjoyed seeing themselves on screen. For the record, these are kids who have experience with other high-end console cameras, so you can expect less tech-savvy little ones to be truly captivated. We had a few technical difficulties with navigation and the camera. Even in a well-lit room, the camera image was on the dark side. I wouldn’t always properly recognize my daughter which was occasionally frustrating. I think we both found that the menu system and controls lacked consistent behavior. The home button didn’t always do what we expected and it seemed that the same action used different controls depending on whether you were in a game or a menu. Lastly, the game titles in the main menu are displayed in such a way as to cause all of us to struggle to get to our specific choices. Some of this will be less of an issue once we’re more familiar with the system, but I imagine that young kids who are just learning to navigate something like this may need some help. 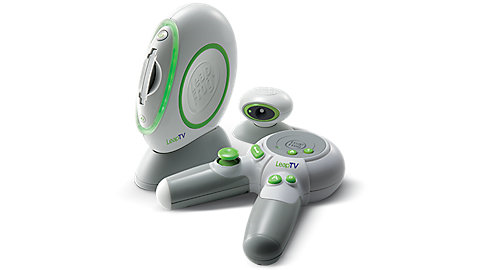 The LeapTV system retails at $149.99 with an additional LeapFrog LeapTV Transforming Controller costing about $29.99. Games are also $29.99 but, as always, you can often find them for less. The LeapTV system does require a TV with an HDMI port, so plan accordingly! Disclosure: We received the LeapTV system with accessories and games for the purpose of this review. There was no additional compensation and all opinions are my own. This post contains affiliate links.